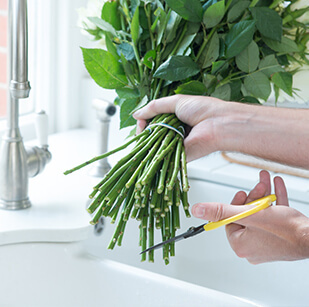 Remove all packaging and trim 2-3cm off the stems, making an additional cut with a sharp knife or secateurs. Remove any leaves that are below the waterline. 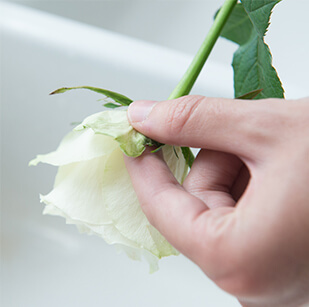 Remove any discoloured guard petals from roses. Please keep your bouquet out of reach of pets as the contents may be toxic and harmful. All lilies come in bud form to ensure they arrive in the freshest condition. To avoid staining from lily pollen, remove the anthers with a tissue as the bud opens. Place flowers in a clean vase. Fill with fresh cold water mixed with the sachet of flower food provided. Do not use metal containers as they neutralise the flower food. Does This Bouquet Arrive In Bud? Is This Bouquet Harmful To Pets? There are over 100 species of roses in the world and the rose is one of our most popular stems. You'll find many species of rose with us at Appleyard London: Avalanche, Memory Lane & Garden roses to name but a few. Each colour of rose is said to have a different meaning. For example, red roses symbolise love and courage, whereas pink roses symbolise appreciation and grace. Cutting your roses at an angle will maximise the surface area of the stem that is drinking up the water! It's good to leave a little foliage on the stem to keep the arrangement fuller. But we recommend to remove any foliage thats below the waterline. Don't worry if it looks like your roses are a little brown or discoloured on arrival. The outer petals are what's known as the 'guard petals', they protect the rose whilst they make their journey to you. You can simply remove these and the roses will bloom beautifully. Roses will need a lot to drink so it's important to choose a vase that will make them look pretty as well as keeping them at their best. Roses seem to hydrate better in deeper and water that is lukewarm (not hot). Placing too many stems in a vase will not give the roses enough room to open up and the lack of room will make it harder for them to feel hydrated. It's important to prevent premature moulding to the leaves and blooms by keeping them apart. If you follow these handy tips then they should last for 7-12 days. We hope you have found these tips helpful and your beautiful blooms last as long as possible. Lilies are a large, often fragrant flower usually blooming in late Spring / early Summer. They are available in a wide range of colours including: white, pink and orange, with less common colours such as: yellow, red and purple. Lilies often have markings on their petals, including spots and little brush strokes. Did you know there are over 90 species of Lily in the world? Our favourites are Oriental & Calla Lilies. Our lilies arrive in bud meaning they are ready to open up. The lily stems sometimes contain more than one head. The heads may not all open at once overnight, but once the stems are trimmed and they are placed in water, they should bloom beautifully. Lilies are sensitive to ethylene gas, a natural occurring gas that speeds up the process of fruit ripening and flower opening. Please do not place your lilies next to any fruit as they may not open! The anthers on lily heads are full of pollen and can stain clothes, furniture and fabrics. 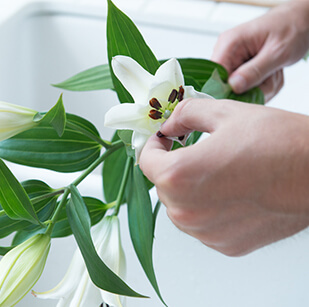 We'd advise that once your beautiful lilies have bloomed, simply cut away the anthers or remove them with a tissue. If any excess pollen should fall off the lilies, please wait until it has dried and brush away. Please keep in mind if you own a bouquet with lilies in or plan to buy some for another recipient, they are extremely harmful to pets, especially cats. We'd advise not to bring lilies into any home with pets and to simply chose another bouquet without them, due to their toxic nature. After a day or two of the lilies hydrating in water, the blooms will begin to open. As the blooms open up you can enjoy their gorgeous fragrance (if Oriental or a fragrant lily) which will become more prominent as they open up. Keep the lilies in a cool place out of direct sunlight, change the water every couple of days to help keep the flowers as fresh as possible. If you follow these handy tips then they should last for 7-11 days. Who doesn't love peonies? These particular blooms are extremely popular during the Summer months and are a favourite for wedding flowers. The delicate pink peony can grow to have a large head and make a stunning display in any home. The most popular type of Peonies are: Sarah Bernhardt, Coral Charm and Mons Julie Elie. Here at Appleyard London, we adore peonies and can't wait for you to experience their true beauty. Our peonies arrive ready to bloom, meaning they are ready to open up and be displayed proudly in a vase. Each stem may not open at once overnight, but once the stems are trimmed and they are placed in water, they should bloom beautifully. After carefully unpacking your peonies from their packaging, choose an appropriate vase to display them in. Next, trim 2-3cm from the stems and fill the vase three-quarters full with room temperature water & the flower food included. Recut the stems and put them in warm water for 24 hours, this should help the peonies to bloom. Sometimes the stems can be covered in a sticky sap that can prevent the stem from opening. We would advise to hold the stem upside down with the head pointing down under a running tap of warm water. This can help wash away the sap. After doing this add the peonies back to the vase as per flower instructions and this should help them open. After a day or two of the peonies hydrating in water, the blooms will begin to open. Keep the peonies in a cool place out of direct sunlight, change the water every couple of days to help keep the flowers as fresh as possible. If you follow these handy tips then they should last for 7-11 days. Hyacinths are one of the most vibrant and wonderfully coloured spring flowers, the more commonly seen colours for these gorgeous blooms are white, lavender and blue. Less common colours are yellow, peach, bright red and dark purple. Fresh cut Hyacinths are a beautiful flower to use in arrangements for Spring time and are easy to care for once you know what to do. When our fresh Hyacinths arrive in bud please don't be alarmed by their lack of initial colour, they are best shipped in this form. The stubby base you see at the bottom of the stem is actually a part of the Hyacinth bulb and doesn't need cutting. Please be careful when handling the bulb of the Hyacinth as it can cause irritation to sensitive skin. Wearing gloves is a good way to avoid any irritation to sensitive skin. When your Hyacinths arrive, unwrap and carefully cut any elastic bands holding the stems together and remove any loose foliage. If you're displaying your Hyacinths in a glass jug or vase you can give the base of the stems a quick rinse if there is any sand or dirt still on the bulbs, make sure to keep the blooms dry. To ensure long lasting blooms please do not cut the stems of the Hyacinths. The basal plate is best left intact as they will hydrate better and last longer if left uncut in the vase. Although this may seem counterproductive, the stems are best left how they are. Fill your vase with around 4 inches of cool water, ensure that your chosen vase is tall enough to support the Hyacinths as they are quite top heavy. As the Hyacinths begin to bloom they will become more top heavy so it is important to choose a vase that is tall enough to support their weight as they come in to bloom. After a day of the Hyacinths hydrating in water the blooms will begin to open. Ensure that you have given them enough space to bloom and they aren't packed too closely together. As the blooms open up you can enjoy their gorgeous fragrance which will become more prominent as they open up. Keep your Hyacinths in a cool place out of direct sunlight, change the water every couple of days or so to help keep the flowers as fresh as possible. If you follow these handy tips then they should last up to 7 days. The name of the 'Sunflower' may have derived from the flower's similar head shape to the sun. Although Sunflowers require little care, there are some important steps to take to ensure they look their best. They are very thirsty and require lots of water to keep them hydrated, especially in the Summer months. Sunflowers could start to look droopy if they are not in the correct vase or have enough water. Our Sunflowers arrive in bloom meaning they are ready to open up once they have a drink. Please don't be alarmed if they arrive looking a little droopy, this is the best way for us to dispatch them. Sunflowers tend to arrive with more foliage than you would see for another stem. Simply remove any excess foliage/leaves that are not needed. When choosing the appropriate vase, we advise to select a tall vase so the Sunflowers have better support as they are quite top-heavy. Sunflowers need lots of water to keep them looking at their best. Be sure to fill the vase with plenty of water to keep them looking their best and for them to really open up. After a day of the Sunflowers hydrating in water, they will begin to open. Alstroemeria, also known as Lily of the Incas, are mostly sourced from either central Chile or eastern Brazil. They come in many different colours including: red, orange, green, purple and white. They also have additional character with their flecks or stripes with darker colours. Alstroemeria are said to represent friendship and devotion. What's more, Alstroemeria have a longer vase life and can last for up to two weeks. Our alstroemeria arrive in bud so they last longer for you. This is the safest way to despatch them to ensure they have a longer vase life and don't get damaged. When you have unpacked your alstroemeria, ensure the stems are cleared from excess foliage below the waterline. Next, trim the stems by 2-3cm, cutting at an angle. Tip: Hold the stems up to your preferred vase and trim accordingly. Add the flower food included with your bouquet to the vase, following the instructions provided. Ensure the vase is filled around two-thirds of the way to give the alstroemeria plenty to drink. Remember to replace your water every 2-3 days. After a day or two of the alstroemeria hydrating in water, the buds will begin to open. Keep the alstroemeria in a cool place out of direct sunlight, change the water every couple of days to help keep the flowers as fresh as possible. If you follow these handy tips then they should last for 7-12 days. Hydrangeas have long been a popular flowering shrub. There are many varieties of Hydrangea out there, with the most popular including: French Hydrangea, Endless Summer and the Garden Hydrangea. The flowers that bloom on hydrangeas are mostly white, however some species are coloured pink, blue, purple or red. These plants need a lot of hydration to keep them looking their best, so be sure to water them straight away. Trim the stems of your bouquet at an angle and select an appropriate vase. Hydrangeas are quite full so we would recommend a wide vase to allow them to bloom beautifully. It's important that hydrangea are plunged into water straight away. They are a very thirsty flower and although we package our flowers in hydration boxes, they will need to be unpacked and placed in a vase immediately. Tip: you can also spray the petals with water to keep them hydrated, as they too soak up the water. In Summer months especially, hydrangeas will need their water topping up regularly to ensure they are nice and hydrated. Once the hydrangea are hydrated in water straight away, the blooms will begin to open. Keep them in a cool place and change the water every day to help keep the flowers as fresh as possible. If you follow these handy tips then they should last for 7 days. Carnations, otherwise known as: 'Dianthus Caryophyllus' can last longer than other stems with the right care. Their meaning can vary depending on their colour; pink carnations symbolise 'a Mother's love' and are a popular favourite around Mother's Day. We particularly love the Vintage Carnations here at Appleyard London with their colour blend of pink and cream. Once you have unpacked your beautiful carnations bouquet, simply trim the stems at an angle by around 2-3cm. Remove any excess leaves below the waterline. Prepare your vase and ensure it is nice and clean, ready for your bouquet to bloom. 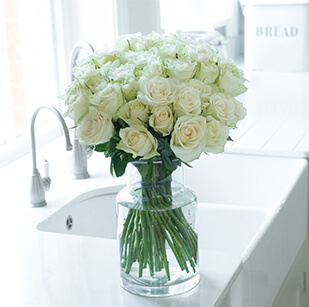 Simply place your flowers in room temperature water and fill the vase with the flower food provided. Ensure the carnations have enough room to bloom and are not packed tightly together in the vase. Some carnation varieties may not look as bright as others. For example, vintage carnations are naturally slightly darker and the petals can look slightly older. However, please note this is purely the vintage-inspired look of the carnations. After a day or two of the carnations hydrating in water, the blooms will begin to open. Keep the carnations in a cool place out of direct sunlight, change the water every couple of days to help keep the flowers as fresh as possible. If you follow these handy tips then they should last for 7-10 days. Freesia bloom in a variety of different colours including: white, pink, yellow, red & purple. They are native to Africa and Kenya, with south Africa as the most popular place. They are known for their aroma and you may find it used in soaps, candles and shampoos. Unlike most other flowers, where the white varieties smell most strongly, if you want a stronger scent choose a pink or red variety. Our freesia arrive in bud to prolong their vase life. This is the best way for us to dispatch them to you so that they last longer. Note that freesia are a delicate flower and should be treated with care. Freesia are sensitive to ethylene gas, a natural occurring gas that speeds up the process of fruit ripening and flower opening. Please do not place your freesia next to any fruit as they may not open. Freesia have 4-6 flowers that bloom successfully on their stem. Remove any blooms that do not open once placed in a vase. After a day or two of the freesia hydrating in water, the blooms will begin to open. As the blooms open up you can enjoy their gorgeous aroma which will become more prominent as they open up. Keep the freesia in a cool place out of direct sunlight, change the water every couple of days to help keep the flowers as fresh as possible. If you follow these handy tips then they should last for 7 days. As a popular Springtime favourite, there are over 150 species of tulips with over 3,000 different varieties. Amazingly you can find tulips in almost every colour. Our favourites here at Appleyard are yellow, white & pink. Another fact about tulips is, even when you cut them they continue to grow in your vase. They also bend and twist towards the sunlight. Because of this, we recommend a tall vase to support the long stems. As tulips continue to grow after you have trimmed them, we recommend a tall vase to support their growth. It's worth noting the stems may bend due to their nature. Your chosen vase should be filled with room temperature water and be about two-thirds full. Top the vase with fresh water every 1-2 days to keep them as fresh as possible. Don't worry, you can re-trim the stems once they are too tall. Tulips will continue to grow throughout their vase life, so if they are looking a bit too tall then re-trim the stems another 1-2cm. After a day or two of the tulips hydrating in water, the blooms will begin to open and grow taller. Keep the tulips in a cool place out of direct sunlight, tulips will naturally bend towards the light so we would encourage rotating the vase every day or so. If you follow these handy tips then they should last for 7 days. Does This Plant Arrive In Bud? Is This Plant Harmful To Pets? One of our most popular plants at Appleyard. Here you'll find varieties such as: phalaenopsis, vanda, miltonia & wonder orchids. However, these are just a few of the predicted 28,000 species which makes them the largest family of flowering plants. As one of the most popular house plants, they are grown on every continent. By following our care tips below this should prolong the life of your orchid plant. Please unpack and check you plant immediately on receipt. If the bark compost seems very dry, add a little water. Stand the orchid indoors in a light position, but not in harsh sun: a north, east, or west facing windowsill is ideal. Maintain a temperature of between 18 and 25°C (65-75°F) and don't trap behind closed curtains at night. Keep the bark compost moist, but not wet, checking every few days and adding a little water when required. Tap water can be used, but soft water (eg rain water) is preferable if available, and the water should be kept tepid. 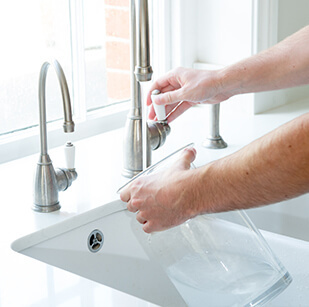 Where possible, water over a sink and allow any excess water to drain out. Food is available specifically for orchids- follow the manufacturer’s instructions, taking care not to over feed. 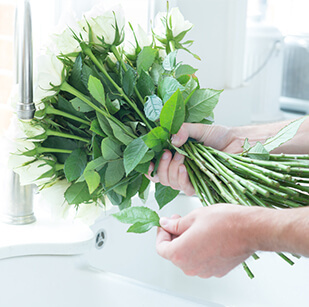 Remove any dying flowers when they are almost ready to fall off without pulling hard. Orchids will flower for several weeks or more. After flowering, cut back the stem part-way down, just above a node or ‘eye’, while the stem is still green. New growth will start from this node and should produce some further flowers after 2-3 months. Alternatively, cut the spent stem off at base level and the plant should produce a completely new flowering stem several months later. Protect all surfaces as scratching or staining may occur. Glass containers should not be put in direct sunlight or picked up by the rim. Some plants are toxic / harmful if eaten by humans or animals and may cause skin and eye irritation. With Appleyard London you can enjoy our Olive and Bay Trees, which are a perfect addition to any home. These evergreen shrubs need to be in full sun or partial shade to sustain a healthy life span. Why not send a couple of our beautiful trees to a friend to adorn on their doorstep? By following our care tips below this should prolong the life of your tree and keep it looking its best. Please unpack and check you plant immediately on receipt adding water if necessary. Stand the plant outdoors in a sunny or lightly-shaded position, such as a patio, near a wall or under and open porch. Shelter from strong or cold winds, very heavy rain and frosts. In winter it is best moved into a more protected position, such as a cool greenhouse, conservatory or porch. This plant can be kept in its existing pot, or replanted into a larger patio planter. If replanting, ensure that the compost and pot drain freely. The compost should never be allowed to dry out completely, but equally do not allow the tree to become waterlogged. Raising the pot or planter above ground level slightly will help it to drain freely. Add some plant food to the water occasionally between late spring and early autumn to keep the plant in optimum condition. During hot spells more frequent watering may be needed and this is best done in the morning or evening. Reduce watering in cold weather and do not allow the pot to freeze. On flowering trees and shrubs, remove any dying or damaged flowers or leaves as you see them. The plant can be trimmed either in spring or late summer to maintain its shape. Attention to these instructions is important to prolong the life of the plant in subsequent years. Protect all surfaces as scratching or staining may occur. Some plants are toxic / harmful if eaten by humans or animals and may cause skin and eye irritation. We have so many varieties of plants here at Appleyard London. Enjoy some of our seasonal favourites such as our Bay and Olive Trees. Or maybe combine some of your favourite plants in one pot with our Seasonal Outdoor Basket and Seasonal Outdoor Planter. By following the care tips below this will help to prolong the life of your beautiful plant. Please unpack and check your planter immediately on receipt, adding water if necessary. Stand the plants outdoors in a sunny or lightly-shaded position, such as on a patio, near a wall, or under an open porch. Shelter from strong or cold winds, very heavy rain and frosts. In winter it is best moved into a more protected position, such as a cool greenhouse, conservatory or porch. The compost should never be allowed to dry out completely, but equally do not allow the planter to become waterlogged. Raising the planter above the ground slightly will help it to drain freely. Adding some plant food to the water every 2 weeks or so between late spring and early autumn will prolong flowering. During hot spell frequent watering may be needed and this is best done in the morning or evening, to avoid scorching the plants. Reduce watering in cold weather and do not allow the pot to freeze. Remove any dying or damaged flowers or leaves as you see them. This planter is designed to provide an outdoor display for a few weeks. After flowering, any healthy plants can be replanted if desired into individual pots to prolong their life. We have so many varieties of indoor plants here at Appleyard London. Here you'll find our favourite varieties of Orchids such as: phalaenopsis, vanda, miltonia & wonder orchids. You can also enjoy our perfect plant hampers for new babies, or just to send as a little thank you. With a life span of up to 2 weeks, follow our care tips below to keep your plants looking their best. Stand the plants indoors in a bright position, e.g. on (or near) a windowsill. A temperature of between 15 and 21°C (60-70°F) is ideal. The compost should never be allowed to dry out completely, but equally do not allow the planter to become waterlogged. Adding some plant food to the water every 10 days or so will help prolong flowering. Remove any dying or damaged flowers or leaves as you see them. This planter is designed to provide and indoor display for a few weeks. After flowering, any healthy plants can be replanted if desired into individual pots to prolong their life. Some plants are toxic / harmful if eaten by humans or animals and may cause skin and eye irritation. Lily pollen is toxic to pets and may stain. Protect all surfaces as scratching or staining may occur. Glass containers should not be put in direct sunlight or picked up by the rim. Our White Rose Plant and Pink Rose Plant make a great gift to send family and friends. The popular white rose plant is also included in our plant hampers, with a delicious box of chocolates paired with a bottle of wine or teddy bear. With a life span of up to 2 weeks, follow our care tips below to keep your plants looking their best. Stand the rose indoors in a bright position, such as on a windowsill. A temperature of between 13 and 21°C (55-70°F) is ideal. The compost should never be allowed to dry out completely, but equally do not allow the plant to become waterlogged. Where possible, water over a sink and allow any excess water to drain out. Adding some plant food to the water every 10 days or so will help prolong flowering. Some plants are toxic / harmful if eaten by humans or animals and may cause skin and eye irritation. Protect all surfaces as scratching or staining may occur. Glass containers should not be put in direct sunlight or picked up by the rim. At Appleyard London we take great care and pride in creating each and every one our luxury bouquets. We're so confident in the quality of our flowers that each of our stunning bouquets is covered by our 7 Day Freshness Guarantee. We only use the finest stems to ensure that your flowers stay fresh for a minimum of 7 days. To give your flowers the best life possible, some may still be in bud when delivered. When in bud, some roses will have a brown or green coloured outer petal. This is a natural characteristic of the rose and does not affect the quality of the flower once opened. You can also be safe in the knowledge that your luxury flowers are delivered with care and attention in recyclable cardboard boxes. To help the environment, where possible we recommend placing your flowers in the garden waste bin or decomposter.